Monsoon Spice | Unveil the Magic of Spices...: Lauki Choley: Complex or Simple? Note 1: Complicated food can have very few ingredients. Complicated recipe doesn’t mean complex flavours. Note 2: Simple recipe can have lots of ingredients. Simple food can have complex flavours. So I have decided to clarify few things and come clean ;) Looking back at the recipes I have posted I did notice that some of my recipes (OK most of my recipes, happy?) do have little lengthy list of ingredients and cooking procedure. But most the ingredients in that lengthy list are the ingredients which are used in almost everyday cooking. Well, the ingredients used in simple tadka or tempering itself has minimum of four ingredients and at maximum it can go up to seven ingredients! At the same time I consider baking to be one hell of complicated recipe to master! (Message to all you wonderful bakers: Would you please stop laughing so loudly and it is not at all lady like to roll on the floor holding your stomach! :P) The simplest bread recipe I had come across has just six ingredients but it doesn’t mean it is easy to make! Does it? Nah… Don’t even try to convince me ;) I won’t be convinced so easily when it comes to baking. I am one of those species who can stand on single legs and cook 3-4 varieties of Koftas, Curries and Biriyanis from scratch and still walk away by the end of it instead of crawling. And at the same time I am someone who dives at the chance of baking a bread from scratch just by looking at the TV show where the host made bread looking job something similar to building a castle on sea shore by 2 year old, then there is a high chances of ending up with a smoke alarm waking every dead soul in half a kilo meter distance! Yup, ingredients are not proportional to the complexity of dish or flavour. So it’s highly inappropriate to judge any recipe looking at the list of ingredients and the procedure to cook it. I hence rest my case!!! Did you get confused again? I don’t blame you… why don’t we forget all my gibberish and come back to the main part of this blog. Yes, let’s talk about food, the glorious food! 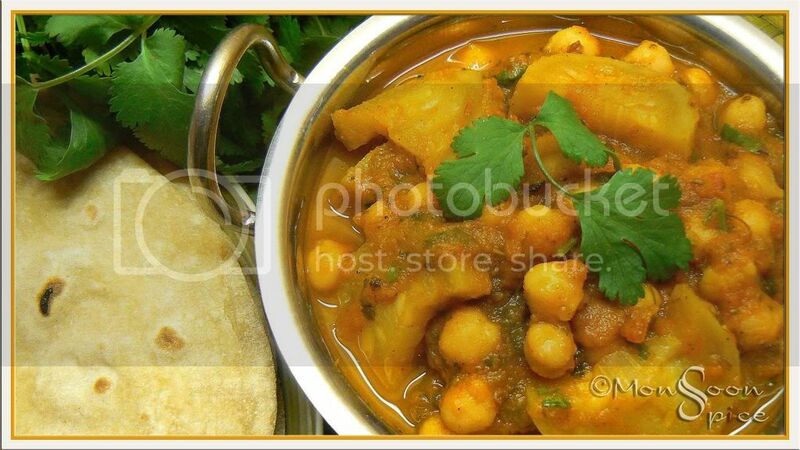 Today we are having Lauki Chole on our menu. Nah… Don’t twist your nose and roll your eyes. It’s not the same Lauki Kala Channa Masala I had posted few months back. It is Lauki and ‘The’ Channa (chickpeas) I want to talk of. It is your usual Chole recipe except for the addition of bottle gourds which really gives a new dimension to this good-old Punjabi recipe. After my successful attempt at combining bottle gourd with black chickpeas, I was left without any doubt of bottle gourd and Kabuli Channa. So there was no hesitation or second thought when I cooked this curry and guess what, it was just as I thought them to be! Little sweet bottle gourds and nutty chickpeas cooked in aromatic spicy and tangy gravy of onion and tomato is something that needs to be tasted to believe. A perfect marriage made in heaven and happily ever after… and please, don’t keep worrying looking at the ingredients list. I can bet my month’s salary that it is not as complicated as it may sound! Sending this delicious bowl of Lauki Chole to dear Valli who is having a love affair with legumes with My Legume Love Affair 7th Helping, an event started by lovely Susan at Well Seasoned Cook. And Lauki Chole is also my entry for this month’s JFI-Chickpeas hosted at a lovely blog Sometimes Foodie. Grind onion, cinnamon stick, cardamom, cloves and cumin seeds to smooth paste without adding any water and keep it aside till needed. Heat oil in a pan and add cumin seeds and hing. When it starts to sizzle and change to light brownish colour, add ground onion paste. Keep stirring the paste till it turns light golden brown and looses its moisture. Make sure that the paste is cooked well or else you will end up with bitter tasting curry. Add kasuri methi and ginger-garlic paste and stir well. Cook this for a minute or two till raw smell of the paste disappears. Then add tomato puree and mix well. Mix in channa masala/garam masala, kitchen king masala, turmeric and red chilli powder. Cook it for a minute or two for all the flavours to blend well. Now add about ¾-1 cup of water, sugar and salt to taste and bring it to gentle boil. Mix in bottle gourd pieces and cover the pan. Let it cook on medium flame for about 5-8 mins. Mix in cooked chick peas and amchur powder. Add little more water if needed and cover and cook for another 5-8 minutes till the bottle gourd is cooked through and all the flavours blend well. Mix in finely chopped coriander leaves just before serving. 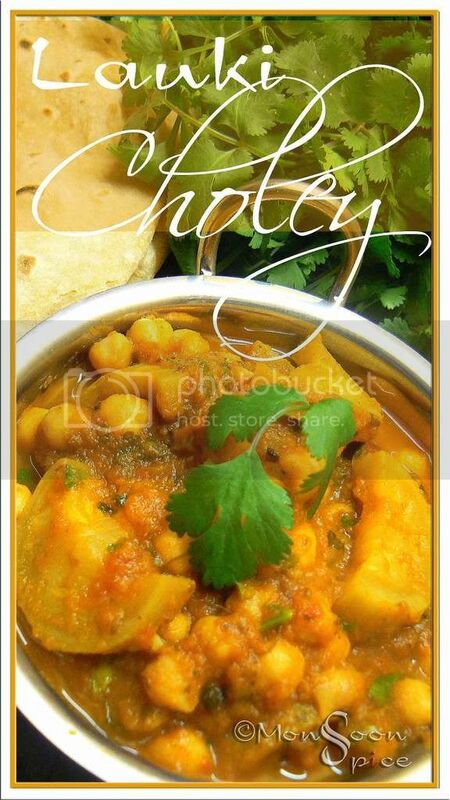 Serve this delicious, creamy Lauki-Chole with any Indian flat breads or flavoured breads and enjoy. Add one medium potato that is cooked and roughly mashed to the gravy which will not only thicken the gravy but also enhances its taste. 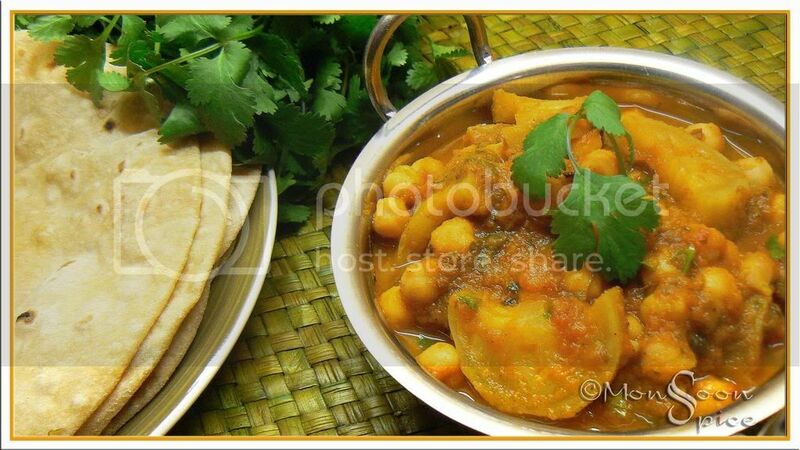 Replace Bottle Gourd with Ridge Gourd or Potatoes or skip the vegetables and just use chickpeas for different flavours. Slow cooking of any lentils or legumes gives a wonder flavour and taste to any curry. But since we are using bottle gourd in this recipe, too much of cooking will result in over cooked bottle gourds and that is exactly what we want to avoid. Very different combo of lauki and channa ! hey sia nice way to eat the boring veggie.. thanks for sharing..
Wat a gorgeous click...just love everytime ur clicks which makes me hungry always, lauki chole looks delicious n awesome..
nice post, Sia. I agree with you on the notes, and I personally find baking tough even if it is just a few ingredients, and like you said, I can make a biriyani and 3-4 dishes meal for 4-5 people and feel so satisfied without being tired! Coming to the recipe, I have never tried cooking Lauki with Chole, I usually cook it with toor dal or moong dal, so would love to try this combination. Your pictures are awesome as always! I agree with you! We do require those ingredients on daily basis - where is the flavor otherwise:) This combo sounds good! how long will u enjoy yummy food akele akele,and tease us with the spectacular pictures ....not fair buddy ! Very Interesting combination!! Have to try this one. Both are my favorites Channa and Lauki. Complicated or simple, your posts are a delight to read and the recipes are fantastic. My husband loves lauki..Complex??? ?I would say its simple :) Nice combo and nice click too..
My brain got a little dizzy reading the simple complex algorithm:-D But i do get it at last.ha ha.. I make lauki chana dal. this is a pretty change. will do it next time. Channa looks really yummy love the como. If you want to start baking, start with muffine or simple cupcakes, they always turn out perfect, which will give you more confidence to bake other complicated cakes or bread. That sure looks yum...and hey I spend more time reading your rambling than your recipe list, though I always knew they are string long..hehehh..thanks for confirming that...:))..so the ones that I have bookmarked, I know they are simple as well they look beautiful! Totally get your point of simple vs complex. Everytime i watch rachel ray in 30 minute meals i get bugged because a skilled persons 30 minutes is not an unskilled persons 30 minutes. A long list of ingredients is long only when one is unfamiliar with the intricate dance within them. In gujarat it generally becomes lauki and chana (split), Thanks for this classic punjabi combination for JFI Chickpea. I couldn't agree with you more. In fact, I even tried to bake a cake this weekend with disastrous results. You have an amazing blog and I love all ur recipes & most importantly the appetizing pictures....The Lauki Choley looks yummy. Hi Sia, the statements are complex and the recipe is simple:)well, i agree that a recipe with a long list of ingredients need not be complex. great pics as always! Hi Your note 1 and note 2 on top of the post says it all about food…was good to read. Recipe looks awesome. Cheers! You have a beautiful blog with excellent recipe.This recipe is a must try.